What Can We Learn From Manta Rays? September 26, 2013 in Animal Stories and Principles, What Can We Learn From... ? Karen and I recently took the kids to a shark and ray centre, a terrific local venue where we could enter enclosures and hand feed a variety of shark and ray species. It was a lot of fun and the kids absolutely loved it. As we interacted with these remarkable animals, I reflected on one of my favourite species in the animal kingdom, the iconic manta ray. 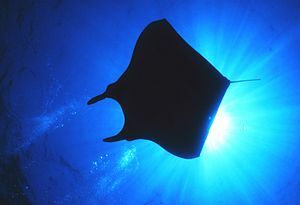 These giant, gentle rays, which can grow to as big as 7 metres wide, seem to fly through the water. They soar, unhurried over the oceans, feeding as they go. As other fish flit from place to place in a mad panic, these noble creatures just float about their busyness, seemingly impervious to the pressures of ocean life. As I considered these beautiful rays, I wondered if I shouldn’t be more like them. Instead of running around like a headless chicken sometimes, wouldn’t it be better if I floated through life unhurried and at peace? Instead of worrying about the future, wouldn’t it be better if I saw life as an ocean full of abundant resources? They are one of the most spectacular creatures in the ocean and a reminder that we are better to soar through life than scurry about. Is there anything else that you think we can learn from manta rays? Previous post – What Comes First, Confidence or Results? I like that. It makes me think of when I used to worry about things that I now find not worth worrying about. Worrying about these things did nothing for me. It did nothing for coming up with creating solutions to the problems. The issues or problem were not me. I made them part of my identity and they made me struggle. Since then many of the same problems and issues are present. But like the manta ray I now soar above them and gradually solve them, no longer running around like the other fish. I went on living while outgrowing them. Thanks for this wonderful analogy. « What Comes First, Confidence or Results?